Have you ever looked at The Elder Scrolls and thought to yourself; “Self, I want to play more Elder Scrolls, but this quality of work is just too high. Why can’t Bethesda deliver a shoddy, low quality version on my phone that isn’t really fun to play and is chock full of predatory microtransactions?” If you’ve ever thought this, boy do I have the product for you. 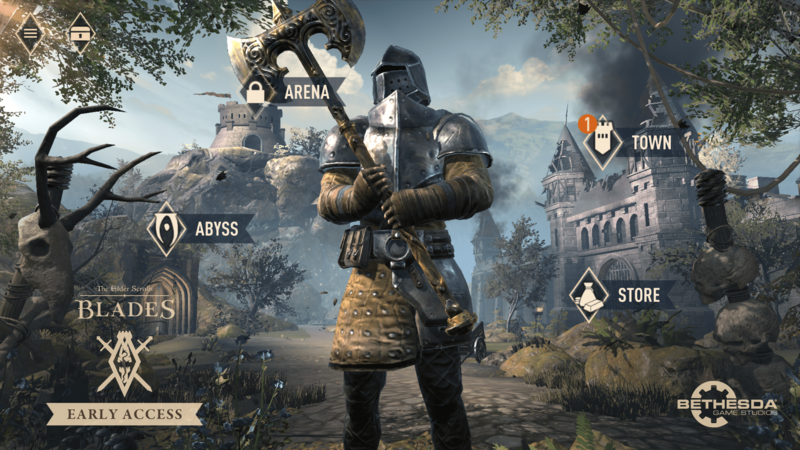 It’s called Elder Scrolls: Blades, and it just dropped on the mobile store for the low low price of zero dollars and zero cents. It’s also in early access, because Bethesda is an independent company who has yet to make a hit game, and needs the money to continue “development.” It is absolutely not a sign of low confidence in their product. A full-fledged Elder Scrolls experience. A game without loot boxes. 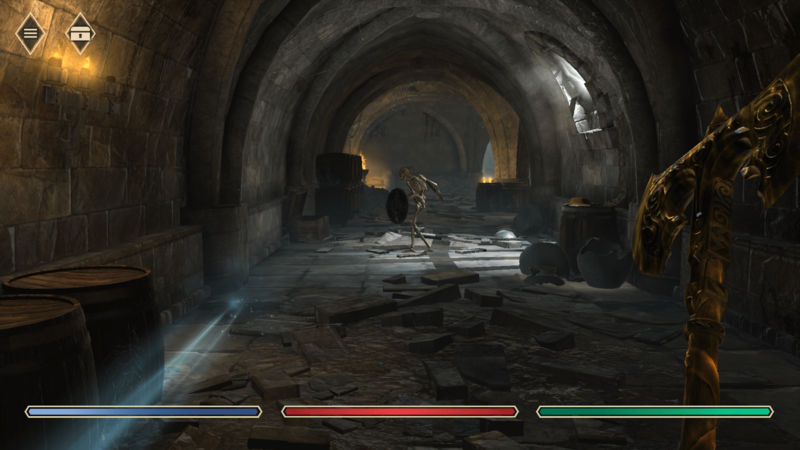 A game with movement during combat. A game with meaningful interactions with the world. A game with any interaction with the world. 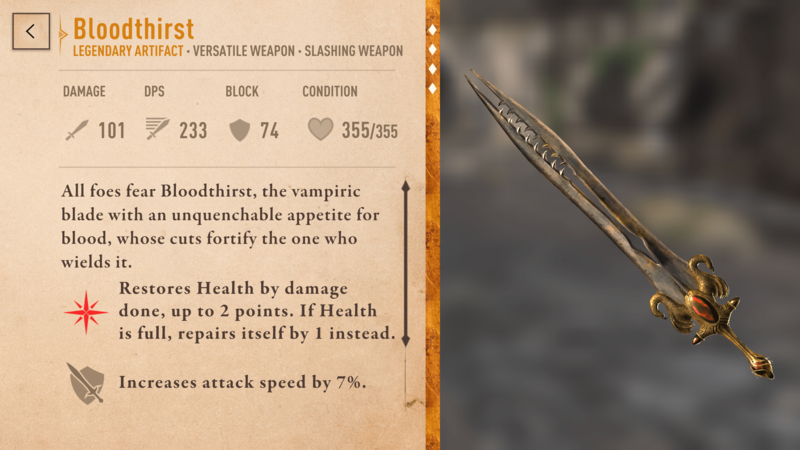 Elder Scrolls Blades follows none other than the Blades. Once hired to guard the Emperor, and then in the service of the Dragonborn, the Blades are no more. You return back to your village to find it a smouldering ruin, possibly because some group of mercenaries came and burned it down but more likely because the village idiot left the oven on and wants an easy scapegoat so homeowners insurance doesn’t deny a payout. As the designated player character, it is your job to figure out who tasked the village idiot with cooking a hot pocket and why nobody was supervising him at the time of the incident. Let’s start by talking about people who can immediately go find something else to do with their time. If you came into this game thinking “boy, I’d love to create a stealthy assassin,” I’ll disappoint you now and let you know that’s not possible. In the time since the Oblivion crisis, biology in Tamriel has undergone a drastic change. Crouching is no longer possible, as is moving your body around while engaged in combat, or jumping, or traversing terrain. The world has suffered a crunch and has essentially become one very long corridor. The bows and arrows, much like the crossbows from Morrowind and Dawguard, were turned into a pyre to burn Bethesda’s respect for their customer’s time and money. Similarly, those of you who want to play a dedicated mage can walk off as well, you’re not welcome here. This leads to what I like to call “unnecessary frustration,” like when fighting the myriad of beasts whose attack pattern is to stand just out of your range and then attack and then go back. Maybe it’s my lack of depth perception but the game doesn’t really seem to be good at figuring out distance with how close enemies are and you miss more than you’d think and you want to walk two feet forward to attack but you can’t because the game firmly roots you to the ground and that’s not annoying at all. It also doesn’t remind you how much the lack of ranged weaponry really degrades the experience in this game. 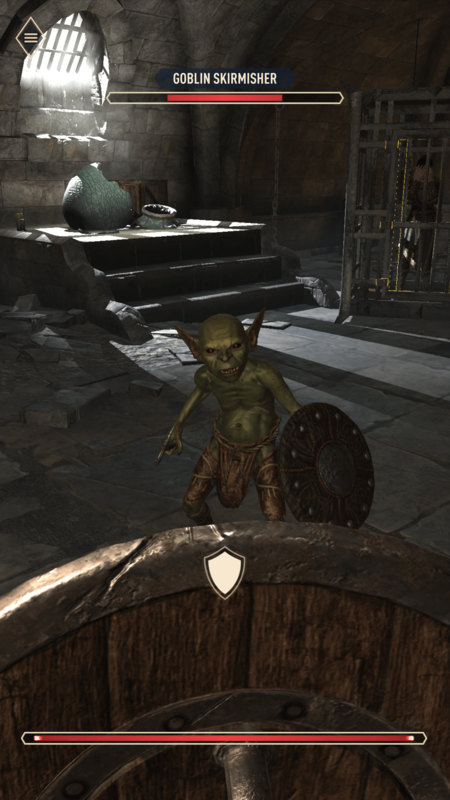 Elder Scrolls: Blades is exactly what you would expect from a mobile spinoff of a well loved franchise; an unreasonable facsimile that takes the original recipe, replaces most of the ingredients with water, and then expects you to pay over the course of the meal an approximate three thousand percent premium over the original piece. And my contempt of the title isn’t just warranted by Todd Howard, the most prolific compulsive liar in the games industry next to Peter Molyneux and the guy who with a straight face told the world that Blades was a genuine Elder Scrolls experience. It’s also fueled by members of the media waxing poetic about how quaint and charming Blades is because the armory vendor lets you sell items and salvage them all in one space. This truly is Elder Scrolls. But truly nothing says insulting intelligence quite like the fact that Blades introduces a guiding light letting you know where to go for your objective. Yes, this game has so little faith in your ability to move that it will guide you down a single path corridor like an infant. Combat in Blades is a matter of holding down the screen to attack and trying to line up the inner circle with the outer circle so you can get a more powerful attack. You can also block enemy attacks. Over the course of leveling up, you’ll add more abilities to your little bar, but it’s basically the same from start to finish. Combat is initiated by getting an enemy’s attention and having them approach you, thus changing the interface to combat mode. As I said earlier, you can’t move in combat mode so dodging attacks is out of the question. Let’s talk about the loot boxes because Blades has these out the wazoo and they are so much worse than in other games. 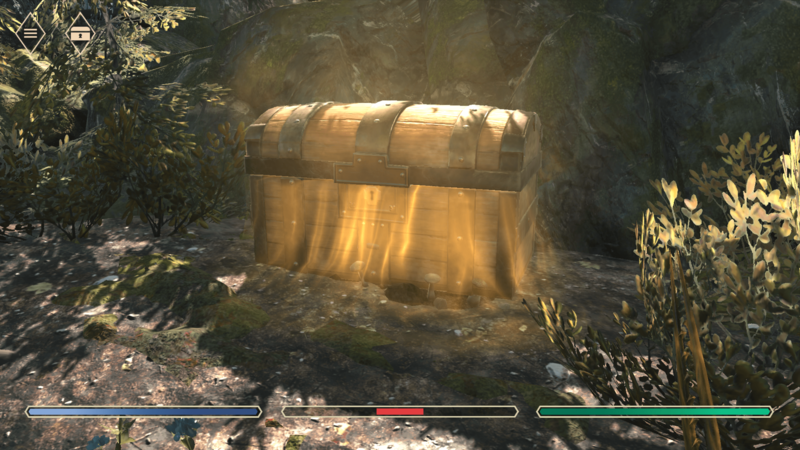 As you travel through the environment you’ll pick up wooden chests which are the bare essentials of life in Blades. For every mission you finish, you’ll generally receive a silver chest (sometimes gold) and occasionally a few gems if it’s a story mission. It’s possible to obtain gems during missions themselves but they are rare and drop one at a time. A wooden chest takes five seconds to open and generally contains miniscule amounts of building materials. 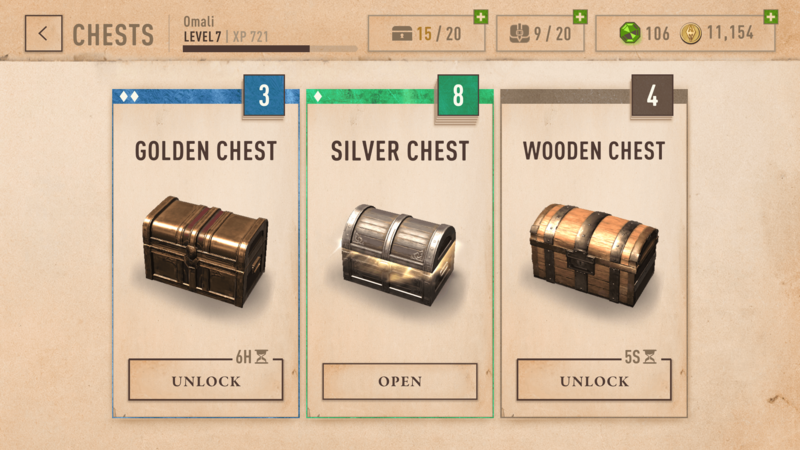 The silver chest takes three hours to open and contains better building/crafting materials and maybe some cheap weapons/armor, and the gold chests take six hours to open and contain better stuff than you’ll find in the lower chests (naturally). The problem that Blades has that players will figure out early on is that the game is very cheap on dropping equipment naturally. I think in the numerous hours that I have played that maybe one weapon has dropped that wasn’t from a chest in the entirety, and that weapon may have actually been from a chest. Remember the days of killing guys and having to sort through their inventory because they were carrying full sets of gear? Those days are over, loser. If you want to get decent gear, you’re going to have to wait like the plebian you are or dish out some hard cash to open those boxes faster. A gem is worth roughly $1.2 cents USD, going by the value that the base cost of a pouch of gems being $1.99 for 160 gems. A golden chest (unlocked) costs 250 gems ($3) and contains 1400-1700 gold, 1 uncommon, 1 uncommon or rare (75-25% split), 1-3 stacks of materials, 50% chance of potions, 50% chance of jewel or rare ingot, and a whopping .1% chance at a bonus artifact. The Elder Chest at 750 gems ($9) gives 3500-4300 gold, 1 epic, 1 extra rare/epic (90-10% split), 1-5 stacks of materials, 2-6 potions, 2-3 scrolls of revival, 3-9 jewels or rare ingots, and a whopping 1% chance of a bonus artifact. Then we have the legendary chest which, at 2,500 gems ($30) offers a whole 5% chance at a bonus legendary artifact. Elder Scrolls Blades feels like going to a restaurant and having the waiter say “we don’t have root beer, but we do have Dr. Pepper.” Really it’s like going to a restaurant and ordering a root beer only for the waiter to slam a twenty year old can of Slice on the table. This isn’t what I ordered, it isn’t even close to what I wanted, and you can almost see the toxic fumes coming out of the can. Another thing I’d like to note is that I went ahead and bought the legendary sword that was up for grabs in the first week for $10. In all the time since I bought the sword, nothing that I have found in crates has been even halfway as powerful which should hammer home how hard Bethesda is going in on the pay to win for this title. Otherwise I have no opinions on the game.